WHO is a United Nations specialized agency concentrating exclusively on health by providing technical cooperation, carrying out programmes to control and eradicate disease and striving to improve the quality of human life. WHO has 191 Member States that meet annually at the World Health Assembly in Geneva. The WHO Regional Office for Europe is responsible for the WHO European region with 53 Member States. 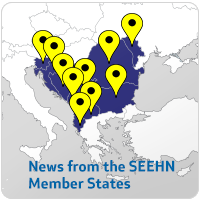 The WHO Regional Office for Europe is one of the founding partners of the SEE Health Network, that in 2001 have jointly with the Council of Europe and Governments and Ministers of Health of the 9 countries in SEE – Albania, Bosnia&Herzegovina, Bulgaria, Croatia, Macedonia, Moldova, Montenegro, Romania and Serbia – committed to invest in this partnership to contribute to the peace and stability of the region through health, that have grown with years into a partnership for economic development, growth and prosperity of the region promoting the health for all through the whole-of-government and whole-of-society approaches.